From December 2005. “Moose-Moose” is a fun group game involving silly faces, odd noises, and hierarchy. Back when we were kid-less, we threw a “White Moose-Moose Party” to play Moose-Moose, followed up by a white elephant gift exchange. Over a dozen people crammed into our little apartment. Fun times! 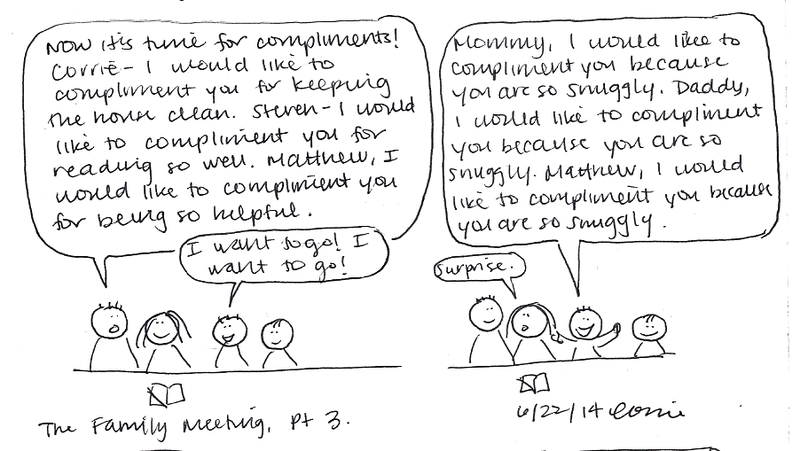 At our family meetings, Matthew will often copy Steven by saying “you’re so snuggly” to everyone. But once in a while, he lets his comic creativity shine. Once our family meeting is started and we’ve prayed, the next item on the agenda is to go around and give compliments. Steve and I try to be thoughtful about the compliments we give to each person. Others… not so much. Steve had been working 12 hour shifts for the past three days, and would be getting home at about 8:30 on Saturday night. The house was pretty messy, but friends were going to come over also at 8:30 to hang out. After a fairly relaxing day by herself, Corrie sprung into action at 6 pm, baking pound cake, cooking white bean and garlic soup for her dinner, biking to the store for a loaf of bread, and cleaning up the house. There was quite a bit of “Steve’s clutter” in the living room, which she efficiently scooped up and distributed back to their homes. At 8:20, Steve walked in through the door. Corrie jumped up, excited that he was home a few minutes early. They hugged and exchanged welcome-home kisses. “How are you?” they both asked each other. Hug, hug, kiss, kiss. Many thoughts flew through Corrie’s head. Because Your Stuff was all over the living room and I had to clean it up! Because yes, I cleaned the whole rest of the house, and I didn’t feel like walking back outside to throw out the recycling! The past three days had been crazy. Leaving for work, working 10-12 painful long hours, coming home really late, barely having time to hang out with Corrie before falling asleep. Steve was really excited to be able to just be home for a few days, get to hang out with Corrie and friends. Walking through the front door, Steve could smell fresh-baked pound cake and other good food smells. He noted approvingly that the living room was spotless. Corrie had obviously found the time to clean the house. He would have helped… if he hadn’t been working so much. In fact, the house looked awesome, but it was odd that the pile of recycling was still sitting in the kitchen, where it had been since last weekend’s party. Weird, he thought, why would she have gone to the trouble of cleaning everything up except for that? “How come you didn’t take out the recycling?” Steve asked curiously. Steve couldn’t help laughing at my sudden outburst. After a bit of tense dialog, where we explained ourselves more clearly to each other, Steve teased me for being a “snapping turtle” (that’s what that creature is in the comic above). He also wanted to know if I had deep-seated resentments that I needed to talk about, since that overreaction must have been based in something. Maybe I am out of touch with my feelings, but I sincerely believed that things would have been fine if he hadn’t said what seemed to me an unappreciative and critical remark. I think I’ve accepted that I generally like things cleaner than Steve does, and that my cleaning schedule is generally more accelerated than Steve’s. Usually I’ll either just clean things up and don’t have angst about it, or I’ll leave it for Steve to clean up a few days later than I personally would have, and it’s fine. But that night was a combination of “his” friends coming over to visit and me cleaning up “his” mess, so I already had an attitude of feeling like I was doing him a favor. When he responded with what he thought was a simple question, I reacted as if he were criticizing what I had done “for him.” My attitude definitely could have used some adjustment — I don’t think healthy marriages involve keeping some sort of tally of “favors” — so that’s something I can be aware of in the future! Family meetings start out with a brief opening prayer. From October 1, 2006. I ran my first (and only) half-marathon, and Steve and his parents cheered me almost every step of the way! Once a week, on Friday afternoons while Benjamin naps, we try to have a family business meeting. We open with prayer, give compliments to each other, talk about the upcoming week, democratically decide on family issues (ranging from behavioral problems to what to do for family fun time), and give out allowance. We have a Field Notes notebook for our agenda and minutes, which Steve or I will fill out as the secretary, and we all take turns being the chairperson (since Matthew can’t read, one of us assists him by whispering in his ear). 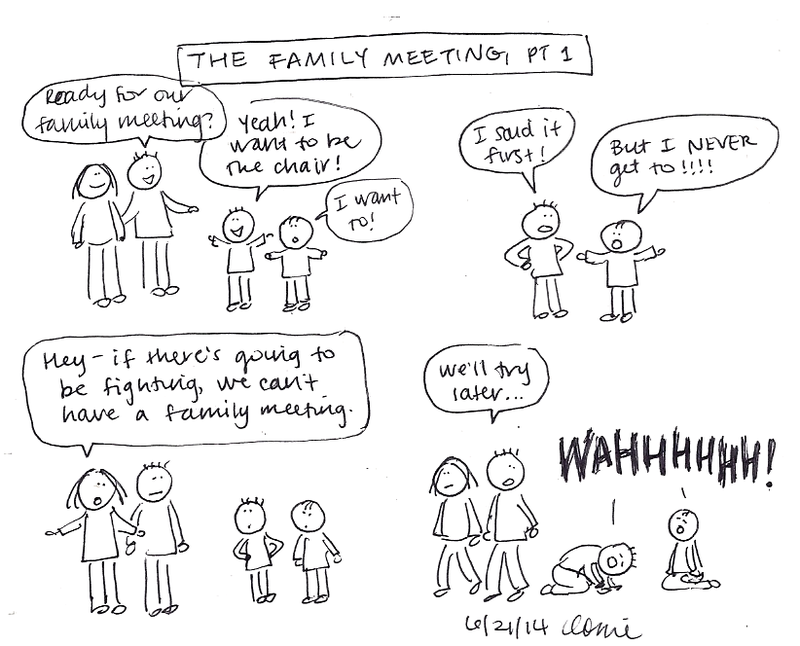 Overall, this has worked out well for our family, but sometimes it’s challenging even getting the meeting to begin! It was a very blustery night and day. In the middle of the day, I was startled by a large thump upstairs. I froze, listening, but didn’t hear anything else and kept working. Not too long after that, the internet and our phones went dead. They came back on several hours later. Steve was working a 24-hour shift and didn’t come back until the next morning. He walked in and said, “Hey, you never told me about the building!” I walked outside and saw that a huge tree had fallen down and knocked part of the roof off of the apartment building right across from us! !